Panoramisch uitzicht op de oceaan! Fantastische zonsondergangen! Walvisobservatie! Je hebt 'The Hideaway at Beverly Beach' gevonden. Ervaar de schoonheid en bewonder het weidse uitzicht op de oceaan. Gelegen in een kleine wijk net ten noorden van Newport. Het is een korte wandeling langs de heuvel naar het prachtige Beverly Beach. Bekijk verbazingwekkende zonsondergangen vanuit het comfort van onze woonkamer. Geniet van de rust en stilte en ontspan. Volledig ingericht met alles wat u nodig heeft, weten we dat u zult genieten van uw verblijf bij ons thuis weg van huis en de vele dingen die Newport te bieden heeft. Maak prachtige herinneringen bij The Hideaway At Beverly Beach. Boek uw verblijf vandaag nog. Alle gangbare creditcards worden geaccepteerd. 1 kingsize bed, 2 queensize bedden, gratis WiFi, breedbandinternet, 49-inch Samsung Smart-tv met Netflix, Hulu, Amazon-video en nog veel meer. LG 2. 1 300 watt draadloze soundbar met subwoofer en bluetooth, Sony dvd-speler, cd-speler, radio-boomstambox, complete keuken, magnetron, afwasmachine, koelkast, kookgerei, wasmachine, grote gasgrill. Home is volledig ingericht. Amazing view and great location! We will definitely stay again. Very nice and clean perfect for a family. The view was incredible and the house had everything we needed for our stay. Would definitely book this house again! Everything we'd hope it would be - quiet, wonderful views, everything clean and as advertised. Thank you for sharing your home! Two families with 6 adults shared the rental for Thanksgiving. The 3 bedroom, 1.5 bath residence sits just south of Beverly Beach State Park on the edge of a bluff immediately east of US highway 101. But the elevation combined with the ocean noise make the highway a negligible factor. The ocean dominates the view from the four large windows that span the west wall. The two bedrooms upstairs likewise have excellent ocean views. The kitchen has everything one could ever need for meal prep, with the ocean view a constant, whether setting up coffee or engaged in food prep. Beach access was convenient from nearby Beverly Beach State Park (the streets leading up to the residence from Highway 101 are pretty narrow to walk directly). Newport is a short drive south, with the Otter Crest loop, Devil's Punchbowl State Park and Cape Foulweather equally close to the north. The 55' Samsung TV made for great football viewing over the extended holiday. We were very pleased with the entire set up and and will definitely come back. We highly recommend you consider this venue. 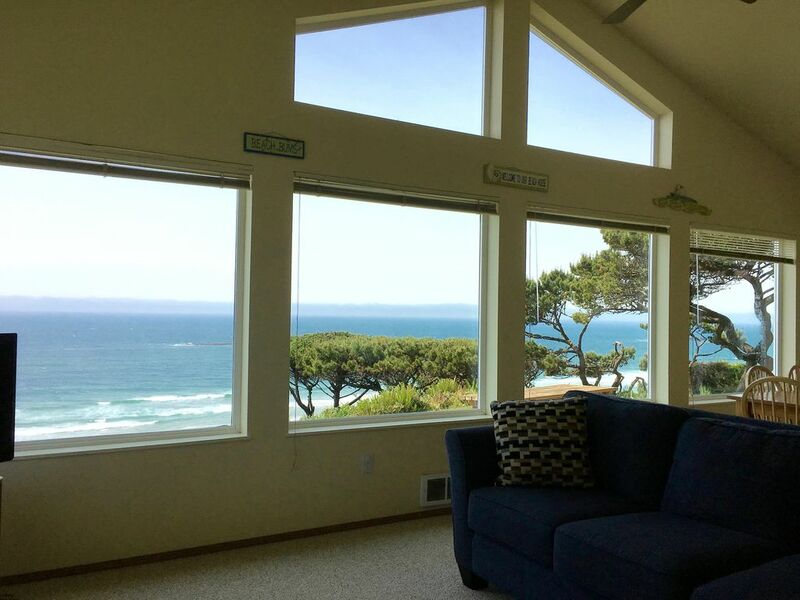 Beautiful panoramic views of the ocean, whales, sunsets, fun beach and close to Newport! The Hideaway in Beverly Beach is 6 mijl ten noorden van Newport Oregon en 1 mijl ten zuiden van Cape Foulweather.